You can help the Lakeside PTA raise money when you go grocery shopping, dine out, and shop online. The following programs give a portion of your purchases back to Lakeside (at no additional cost to you!). Contact our VP Ways and Means at waysandmeans@lakesidepta.org for more information. You will then be directed to select your charity. Do a search for Lakeside Middle School PTA and hit select. Then you are ready to shop! 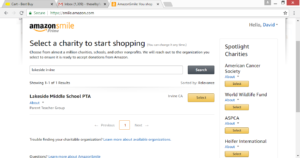 Each time you want to shop at Amazon, just go through the smile.amazon.com browser and a portion of your shopping will be donated back to Lakeside Middle School. Please feel free to pass this on to family and friends to shop at Amazon. Lakeside will receive a portion of the proceeds from lunch or dinner sales at local restaurants. We’ll send you an email when our next restaurant night is scheduled. Log onto Target.com. Enter your information and designate Lakeside as your beneficiary. Your card must be re-registered every year Starting September 1st. Log onto your Ralphs account at ralphs.com and choose Lakeside as your beneficiary. Simply clip the Box Tops off of eligible products and send them to school.